Julianne Moore, left; Sarah Palin, right. From a natural born killer to a mama grizzly, Julianne Moore is proving that, at age 50, she’s still got a lot of great work ahead of her. The actress, who recently starred alongside Annette Benning in The Kids Are All Right, is turning her attention to the political arena, and she’s focusing on a winking, sly, former mayor of Wasilla, Alaska. 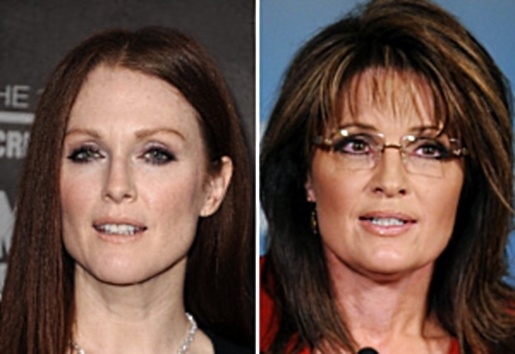 Julianne Moore is taking on the role of Sarah Palin in HBO’s new movie about the 2008 Presidential election. The movie, Game Change, is based around the unsuccessful McCain campaign and their selection of the little-known Palin as a running mate. It is based off the book of the same name by Mark Halperin and John Heilemann. HBO has lots of experience with TV movies, and they’re no stranger to politics. The team behind Game Change, director Jay Roach and writer Danny Strong, also produced the 2008 HBO movie Recount, about the tumult in the wake of George Bush and Al Gore’s 2000 election contest. It’s a really good movie, if you didn’t see it (and even if you’re not particularly political, as it’s stocked with great actors throughout). Still, is there really going to be an audience for this kind of film? When you consider that she’s a part of recent history, and is still making waves with her word creation skills and claims of blood libel, is there a little Palin fatigue that might turn off otherwise interested viewers?